Just in case you didn't already know, there really is a difference between a frog and a toad. Google it and you'll see what I'm talking about. I always sorta figured they were the same....or pretty similar anyway but they really are different. Toads usually are found more on land instead of in water like frogs. Also, toads have a squat-tier body where frogs are skinnier. Interesting - right? In other words, way back when you were young and called your boyfriend a toad, you were probably right! We all dated toads I'm sure - at least I can think of one I dated. He didn't like to swim at all and really did have a squatty body. He was definitely a toad - and probably still is! Eek! Anyway.....in case you're wondering - these little guys are frogs. They're from Sunny Studio Designs and are much too precious to be called a toad. It's a good set to create a scene and I think it'll be a cute birthday card. All the images were colored, cut out, and then placed on the card after creating the 'water' and clouds with distress inks. Of course I just had to add the heart and belly button art (pearl) to mama and the bow tie to papa. .....And believe it or not, I'm going to enter this in the challenge at Pixie's Crafty Workshop. I finally feel like I'm creating a card with snippets on it! It's been a long time since I've been there. Too long! Love your card, Lynn! These frogs are adorable! My Dad loves frogs so I like to make him frog cards from time to time. I did wonder the difference between frogs and toads - your blog post is so funny! Thanks for clearing that up, Lynn. They're both eck to me, especially if they're in the house! But your frogs are nothing but fun! They made me giggle! Awww this is adorable Lynn! I love the fun scene you created and the frogs are sooo cute! Before I married I dated both LOL... one super skinny and one squatty, so happy my hubby is just right!! 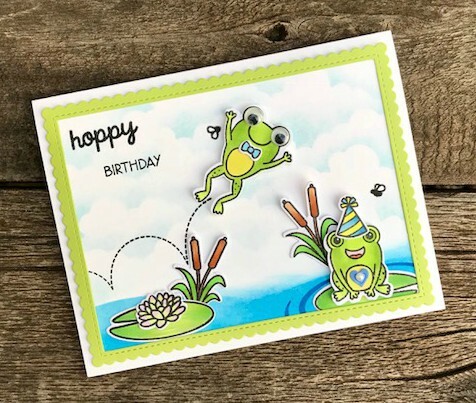 A delightful card with these cute little frogs (the only kind I like. DH likes frogs!) It's cheery & fun, and I loved reading your backstory about the diff between toads & frogs. Who knew? Actually I don't like either one (of the real life kind!) Ugh! But I do like the ones on your cute card. TFS & Hugs (and hooray for the Snippets Playground. They'll be happy to welcome you). Oh how fun! Love this card, Lynn!!! Love this card and it's wonderful to see you in the Playground with us Lynn! Such a happy little scene. Loved your dissertation on four-legged, hoppers, Lynn, and I personally think you should be awarded your PhD! lol Fab and fun card, my friend, and I really love the background that connects the entire scene. Well done! Love this card and your frogs are wonderful. Thank you for the explanation and yes I have dated a toad or two in my time. Greetings Lynn, well who doesn't just love googly eyes. Love the scalloped frame and adorable little frogs. Flies and frogs!! I love this fun card, Lynn! So cute and very fun! Oh yes, froggies it is! What a great scene, Lynn! I do so love Sunny Studio stamps. So many critters, eek! How cute! I need to play catch up...I see I have missed so many of your neat cards!